Money and how to create a solid massage business that keeps making money is one of the biggest challenges for massage therapists. The thing is that the meaning of money is so filled with so many old beliefs and emotional ties that it makes money look like the bad guy. People equate making money with being greedy, having to sell your soul to make money and undervaluing their time and work. The process of taking a look at your money autobiography and learning about money and just what it is can take the emotional projections out of dealing with money. Keeping financially balanced (out of debt and not spending more than you make) is just another form of self care. Most of my career I was in debt and always behind. It wasn’t until I realized that business is just a math problem and it doesn’t mean I wasn’t doing something right or wasn’t good enough, the money started coming in. The process of taking a look at what is coming in and going out and combining it with a plan for things you want both in your personal and professional life can take the stress out of dealing with money. Harv Eker author of the Millionaire Mind put it clearly in his book. He was talking about how someone was saying “It isn’t about the money” in relation to their business. He replied “So you don’t have any right?” That really hit the nail on the head for me and I would think for many massage therapists. While I am not a financial expert, I do share some tips and hints for taking a closer look at the meaning of money and how it plays into being successful as a massage therapist. There isn’t any reason why you can’t make $100,000 a year as a massage therapist or be a wealthy massage therapist. I don’t want to charge a lot. I want to make massage available to everyone. I don’t want to charge much because massage is such a meaningful and beautiful thing. While these things are all well and good, they really are big indicators of much bigger things in how you value yourself as a massage therapist and how you value your time. As a massage therapist you are charging for your time. How much is your time worth to be away from your family and your life? How much time have you put into learning about massage and learning about business? The caring part is actually free. You aren’t being paid to care. You are being paid to be of service and for giving your time to the service. Learning to set your rates and ask for what you deserve to make in order to stay in business and make a good living is a process. It is also one of the highest forms of self care to have the money that you need and deserve. To have money is somehow wrong. In fact, it can be corrupt and immoral. 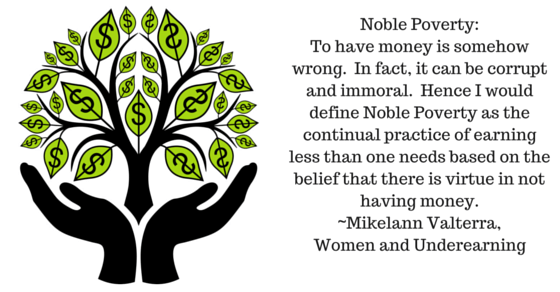 Hence I would define Noble Poverty as the continual practice of earning less than one needs based on the belief that there is virtue in not having money. Because of the belief that not having money is Noble, people who live like this will often make false assumptions about people who have money. That type of thinking will limit people from making more money. We acquire these beliefs from growing up and seeing how other people treat money and talk about money. Living simply is not the same thing as Noble Poverty, but it is often confused by people who choose living simply. The Main part of financial recovery is really about taking a deeper look at the beliefs you hold about money and how they influence your decisions or lack of decisions. It is also about creating a Spending Plan rather than a budget. Budgets are so restrictive and limiting. A Spending Plan is about planning for your expenses (which includes savings and getting out of debt) and then figuring out a way to make that amount that you plan on spending. It is coming out of the money fog and becoming aware of your daily/weekly income and expenses. It may be about cutting back but not always. Meeting our needs is a vital aspect of a healthy relationship with money. Spending money on wants is often how people get themselves into and keep themselves stuck in the Money/Life Drain. When we sort out our needs from wants (and this is a much more subtle operation than you might at first think), we can address deprivation at its core. Deprivation is the wound that develops when our most essential needs – physical, emotional, social, or spiritual are not met, particularly when these needs are not met for a long time and even more so when this happens to us early in life.